Hello WOYWWers. If you are thinking what’s that all about? 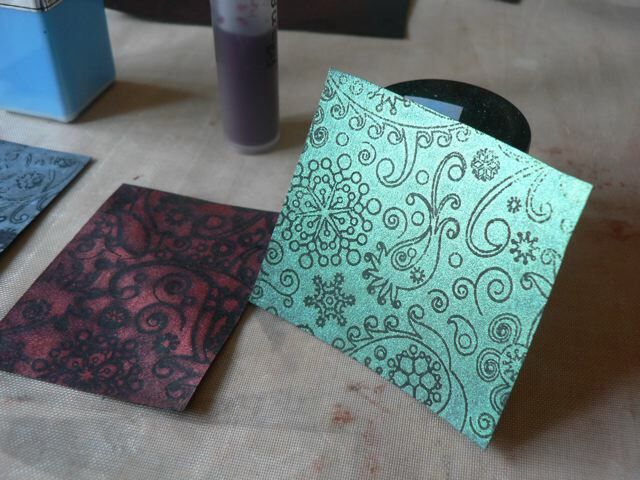 then you need to pop to Julia’s Stamping Ground and see what the fuss is all about. Worldwide inspiration is the name of the game every Wednesday. The last one, the 6 of Diamonds, I did on Monday and I loved the batik effect – but it make me think about other things I could play with to get the same sort of effect. So, today, what is on my desk is a variety of things, some of which I have played with already, and some which are in the queue, so to speak. 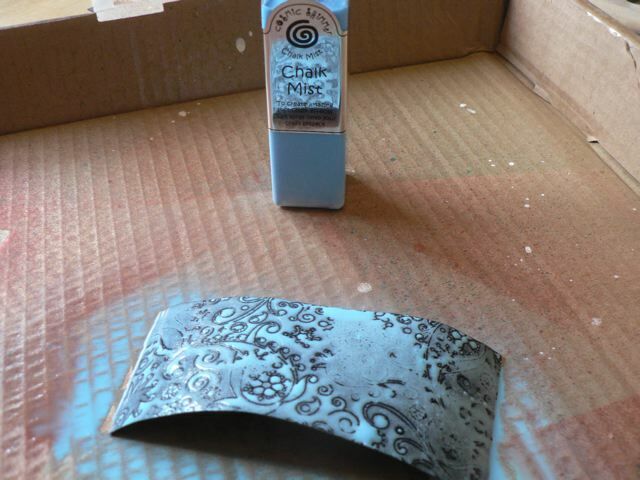 The basic idea is to stamp a nice all-over pattern with Versamark or some other clear embossing ink. I’ve not yet worked out if one with some negative space is better or just different. 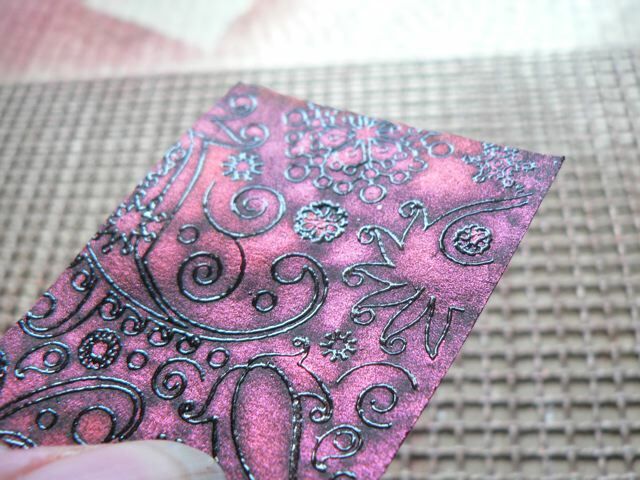 Then emboss it with clear embossing powder. Then cover the piece with….something. 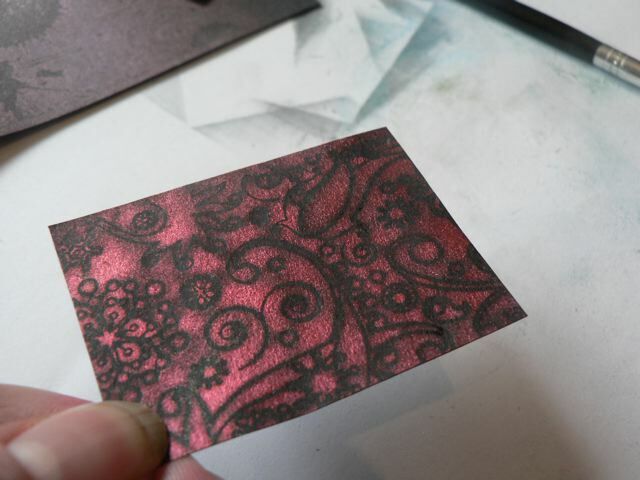 Then iron off the embossing, revealing the cardstock underneath. Yesterday I played with three additional things – chalk mists, Cosmic Shimmer mist, and Pearl-ex again, but with a more open stamp. Chalk ink first. I need to figure out how to carry on doing the Hearts, Spades and Clubs for my cards. I thought as I had done white backgrounds for the Diamonds I would do black backgrounds for the Hearts, but black cardstock doesn’t REALLY lend itself to inking, so resist techniques seem the way to go. And the whitewashed effect of the chalk ink seemed like it might work well with a black base. Same as before, stamped with Versamark, embossed with clear, then misted (heavily) with chalk mist. I did lett it puddle and pool so some areas were more covered. Dried it (or let it dry, as you prefer) then ironed off the embossing – I do that between the pages of an old notebook. How cool is that? Not perfect, but then I aim for more distressed then pristine so that’s lucky! Then I thought what about Cosmic Shimmer? I had to decant some of the CS mist into a mini-mister (OK so I love CS a lot better than the paler Glimmer Mist, but seriously, how can you not spray more than once or twice without them getting clogged?) but managedtoo spray in the end. That is before I ironed off the embossing. 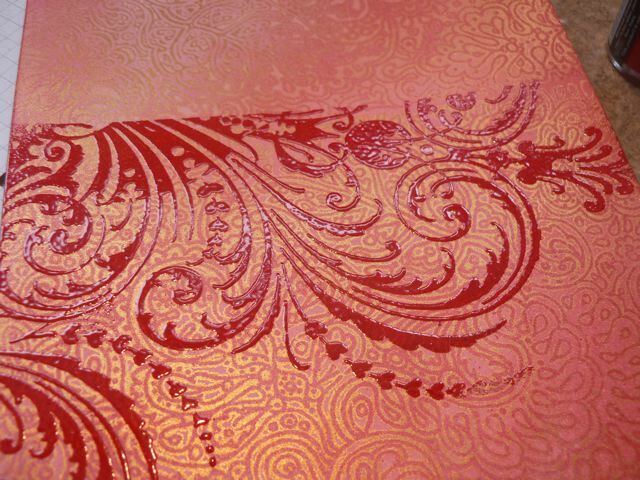 I like that too – the embossing resists the mist and stays quite shiny. But then when you iron it off…. Again, more distressed and less perfect, but then I wasn’t using really high quality cardstock either, so who knows what came in to play? I did another Pearl-ex one, this time with a stamp that had more open space. I rubbed Black Soot over the embossing, rather than a lighter colour, as black ink over black card made sense to me. Again, liked it before I ironed off the embossing, and liked it after. This one had the least difference between them. I have more ideas on other things to try, and THAT is what is on my scrappy, sticky, inky, messy desk this Wednesday! Sorry if that was all a bit TMI but I am really excited about the whole thing and looking forward to playing some more. Let’s just hope Blogger cooperates at least as well as last week – although if you have word verification on I’ll look but I’m not even going to try to comment. Well, maybe on the first one I come to but I’ve not managed to comment on a single blog with WV in three weeks so I’ll save my typing fingers! Have a Happy Wednesday. I’m scheduling this but I think my clock is wrong (or WordPress doesn’t realize we are not in British Summer Time now) so you may be seeing it late Tuesday night. 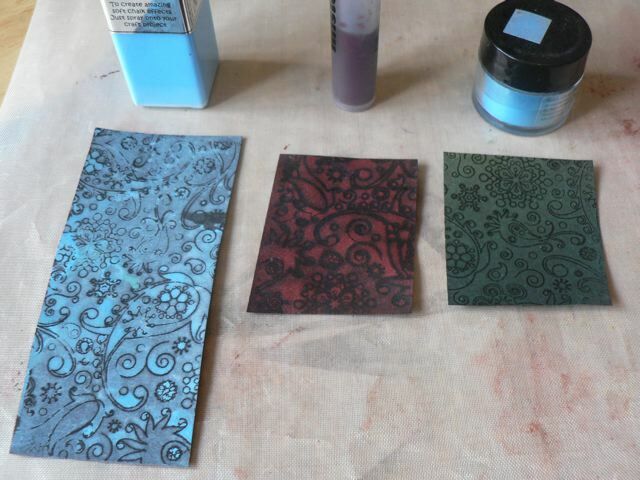 Love that turquoise one, this is a really interesting technique, I will have to take some time and check it out. I love looking at other people’s play. They turned out beautifully! 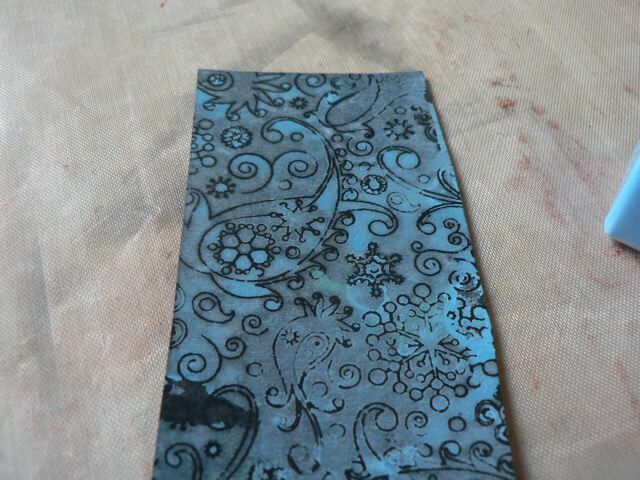 Your batik is beautiful, especially the one with the blue…chalk is a onderful medium. I think they are all fabulous and thank you for showing them all . I’ve just had ONE of those shimmery mists and it never really does much! (I’m just rubbish!) Sorry I’m late, no internet connection for most of the day and then I started upwards! just hope I didn’t delete you earlier today by mistake..!Thanks for my snoop! HaPpY WoYwW!! Have a very crafty week! Gorgeous! I love your work! Thanks so much for sharing your talent! That batik stuff sure is a fun technique. I’m not into techniques like that myself but I can oogle from afar. I really like some the pre-ironed versions a lot, so much so that if I made them I’m not sure I could iron the embossing off, although I like that look too. I could never decide! wow, what wonderful creations on your work desk!!! Love your blog. Love the look of these! great ideas, all. So much to see and so many techniques and so little time! I’ve given up trying to work out which time zone my blogger works in! I really love your ongoing project with the cards! I’ve been toying with making something along these lines with tags as a way to remind myself of techniques I’ve learned, with directions on the back. The batik technique is interesting — hurray for experimentation. I love your playing cards, really inspired by them. They look amazing Mary Anne, the colours are stunning, especially the Red one that’s ducted with Mica. All of these cards look great! And it is a neat idea to use playing cards to try out all these different techniques so they will still be a set even though they are all different! Thanks for letting us look in, enjoy WOYWW and your week, Sarah at 16. Wow what stunnig results and effects from your playing. Love the playing card. 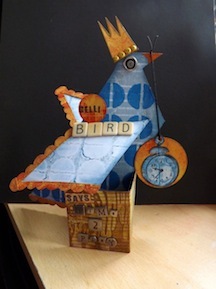 Loving these examples MA, love the ironed /half effect on card 6 of course, but generally, think this batik idea has legs…hmmm….another masterboard idea…. WOW! I am impressed! Love what you are doing, it looks like so much fun! I love your playing card project and thanks for sharing your faux batick technique. Wow, what a lot of fun techniques. I will have to mark this and come back to it. the cards look great and i like the results of your experiments. I love what you are doing with the playing cards – they look fabulous. What would we do with our Wednesdays if it was not for the wonder of WOYWW? It’s always fascinating to peek through the window into your creative arena so thank you. Hope you have a good week I love your experiments; the first one is my favourite. 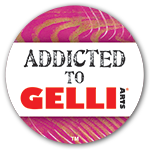 ,loved the techniques you did!!! So many different techniques! Why do you iron off the embossing? I think it looks beautiful. Wow, I love all your techniques. What fun! Oh! I’ll have to look up The Yarn Harlot, never heard of her before! Brilliant idea, absolutely fab technique, really love the red one, hubby says he really likes the blue one! I set up a google account a long time ago and I use that for posts with word verification instead of wordpress, as blogger is being really stupid recently! They should all come over to wordpress instead!! This is a GREAT post! I really enjoyed seeing the effect before and after ironing. Altering the deck of cards is pretty neat. You are one clever lady! It’s only Tuesday evening here in the US so I will have to wait to link in. Love the different techniques you are using. Messy crafts scares me I’m sorry to say. But just love the effect. Think I am too frightened of doing it wrong and steer away from the paints, inks and mists. I’ve never heard of chalk mist. It sounds very interesting. I like how you are playing, especially with the cards. I am #9 this week! Wow! I LOVE what you are doing with those playing cards! what a fab idea, your cards look great, but sorry at this hour (almost 1 am) i couldn’t read it all. will visit another day (or possibly night). 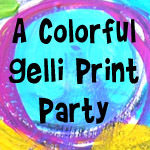 Love the results of your inky project. Great idea. Nice to be able to visit so early or is it really late? Well, would you believe it? I can’t actually leave a comment on your blog from my work pc. ROFL….. How ironic. Anyways, here I was, on here, to download a couple of your pdfs for Project Life, and up pops your post for WOYWW. Me, I manually post mine and then change the date and time to Wednesday afterwards. Life is a lot easier now! Now all I have to do is get myself linked up a bit quicker in the morning! 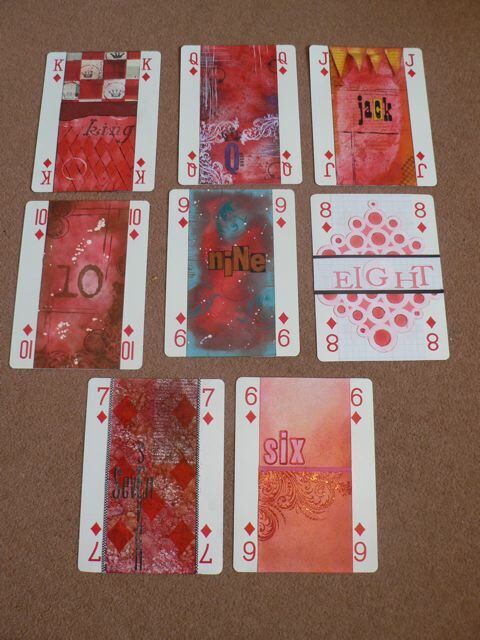 Great work you’ve been doing this week with the playing cards, by the way – they look fab! I think I prefer the pink one before you ironed off the embossing. How do you get your stamped images so lovely and shiny? I’ve only just started with this technique and mine are pretty flat and dull. This post confused me in another way too. It says posted on 22/2/12 but its 23:08 on 21/2/12 and as far as I know there is only one time zone in the UK. And ps, on the embossing? I think the powder you use makes a big difference. I got some WOW powders recently and like withe the red, it is REALLY shiny. HTH!